In alternating current work and especially with poly-phase systems where motors are used to a considerable extent, the power factor becomes of great importance, as it not only affects the economy of the system and size of apparatus required, but, what is fully as important to the station manager, it seriously affects the regulation also. In direct current work it is a well known fact that the product obtained by multiplying the electromotive force into the current corresponds to the amount of power which is being delivered by the circuit But in alternating current circuits it quite frequently happens that heavy currents are being transmitted at a high voltage, while but a small amount of power is being delivered, and the product of the volts into amperes does not give the true power, but only what may be called the apparent power. The ratio of the true power to the apparent power is designated by the term power factor. It may be anything between one and zero and depends upon the "angle of lag," or the amount, which the current phase lags behind the phase of the electromotive force. If the current is exactly in phase with the voltage, the true power will be equal to the apparent power, and the power factor will be unity. But if the current lags behind the voltage 90 degrees, or ¼ phase, there will be no power transmitted, however much current may be flowing, and the power factor will be zero. The efficiency of an alternating current system depends to a great extent upon the power factor at which it is working; for however small the true power which is being transmitted by a circuit may be, the heat losses are unaffected by the amount of voltage or its phase, but are always proportional to the amount of effective current flowing. Therefore the capacity of the generators, of the transmission circuit, of the transformers, and of the motors must be proportioned to the value of the apparent power. The lag of the current behind the electromotive force depends upon the amount of self induction in the circuit, and is affected, to a considerable extent, by arc lamps and transformers. But the most serious effects tending to lower the power factor are produced by alternating current motors, and especially by induction motors. 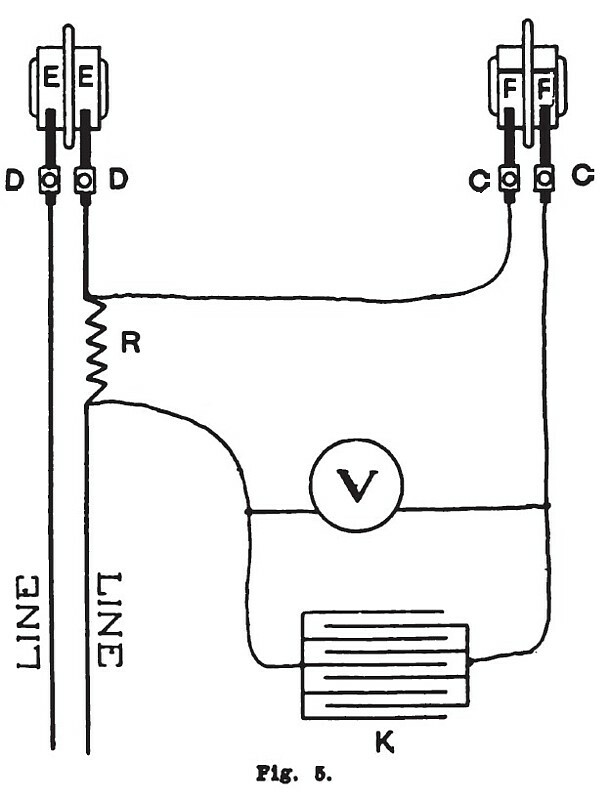 Condensers are sometimes used to counteract the effect of self induction in a circuit, since their action is to give a lead to the current, and to cause it to flow in advance of the electromotive force; so that by proper adjustment of the capacity of the condensers to the inductance of the circuit, the lagging current is brought into phase with the electromotive force and the power factor is consequently raised to unity. But condensers of the necessary capacity, made for high voltages, are hard to make and very expensive. In fact the expense is prohibitive in most cases. Synchronous motors, however, have a peculiar property, which can be utilized to compensate for the inductance in the line, and to bring the power factor back to unity. The current which is taken by a synchronous motor will lag behind the voltage, or will have a lead, according to the under or over excitation of its fields. If the field coils of a synchronous motor are over excited it will act as a condenser and will tend to produce a lead of the voltage. 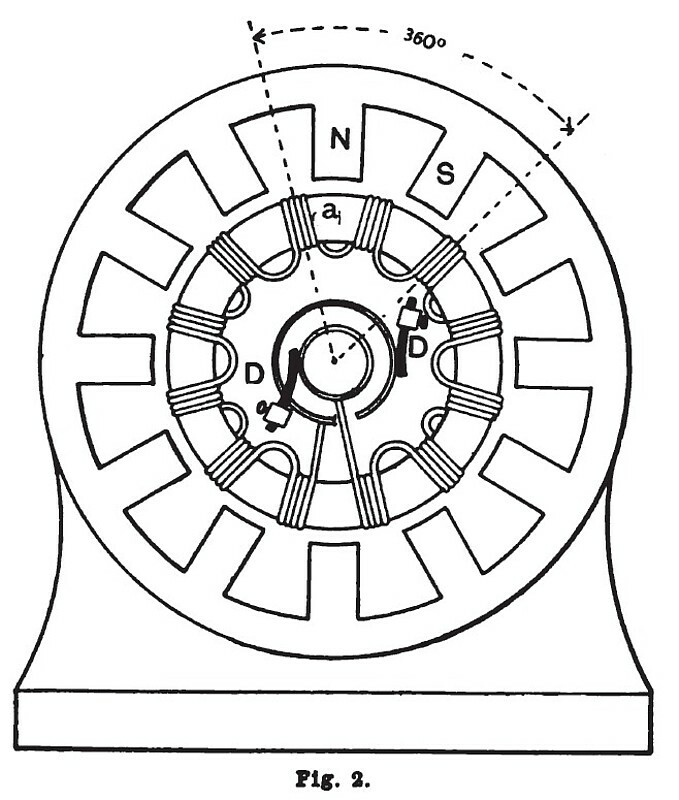 The capacity of a synchronous motor to compensate for a lagging current is so great, that in large power installations having high inductance, and supplying current to numerous small induction motors, it is generally of great advantage to install, somewhere on the system, a large synchronous motor which has practically a constant load, and whose field excitation can be adjusted to compensate for the lagging current and bring the power factor up to unity. In a system of distribution where many induction motors are used, the power factor continually varies, and should a condenser or a synchronous motor be installed to compensate for the lagging current, its adjustment would require changing whenever the power factor varies. This gives rise to a demand for a power factor indicator, which could be installed along with such a condenser or synchronous motor, and which would always indicate the power factor at which the system was working. An instrument of this kind, which could be placed upon the switchboard and could be used in making adjustments of the capacity of a condenser, or the field excitation of a synchronous motor, would come to be as valuable and as indispensable as the voltmeter for making adjustments of the field excitation of the generator. The true power of an alternating current circuit can always be found by a wattmeter of the dynamometer type; but the wattmeter is independent of the apparent power, and, when used alone, gives no idea of what the power factor may be. There are a number of methods of finding the true power and the apparent power, but they all require a number of readings and a calculation for the determination of the power factor. Aside from the inconvenience and liability of error, the time required for taking the readings makes the method impossible under such varying conditions of load and power factor as prevail when motors are being operated. A great deal of attention is being given at the present time to the development of new ideas for power factor indicators, but all the instruments which have yet been produced have been declared unsatisfactory for practical work. Most of them are unreliable in their readings, especially when the power factor is near unity. The following is a description of a method which has been used to a considerable extent in electrical laboratories for plotting the curves of current and electromotive force in alternating current circuits. Although it is somewhat arduous and requires a number of readings, making it necessary for the conditions to be maintained constant during the test, yet it not only has the advantage of giving the power factor without a calculation, but also furnishes a method of testing the generator for armature reaction, and shows the exact relation existing between the current and the electromotive force. The instruments required are a contact maker, a static voltmeter, and a small condenser. The condenser is not indispensable, but more satisfactory results can be obtained by its use. There is no reason for considering this an exclusive laboratory arrangement, for it could easily be adapted to engine room work. In fig. 1 is illustrated a contact maker as made and applied to a small alternator by the students of electrical engineering in the Soldiers' and Sailors' Orphans' Home at Xenia, O. A is a graduated disk which is fastened rigidly to the frame of the machine, its hub being centered by a hole in which the shaft of the generator, or an extension of the shaft, may turn. Upon this hub is carried the arm B in such a manner as to turn freely through a certain arc around the center of the shaft, and carrying a pointer over a graduated circle on the disc A. The arm B can be adjusted and fastened to the disc A at any desired position, with its pointer indicating the angular distance through which the arm has been moved. This arm serves as a brush-holders yoke, carrying the two brushes C C, which are insulated from each other, and whose function is to close a voltmeter circuit for a very short space of time, once in every revolution of the armature, by making simultaneous contact with the bar e, which is imbedded in the two insulating rings F F. These rings are mounted in the same way as the collecting rings of a generator, and are keyed to the shaft of the machine. For plotting the curve of volts, the instruments are connected as shown in fig. 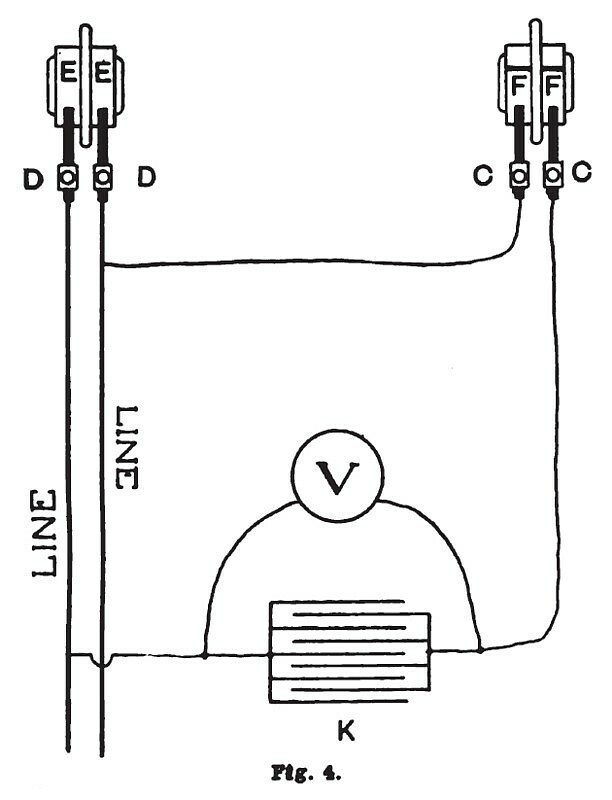 4, in which D D. are the brushes taking current from the collector rings E E of the generator; C C are the brushes on the contact maker, V is a static voltmeter, and K a small condenser, which serves to keep the reading of the voltmeter steady at the value of the electromotive force on the line which corresponds to the position of the armature at the time of the closing of the voltmeter circuit by the contact maker. The same amount of voltage is generated in each coil at any position of the armature, and, as shown in fig. 2, all the coils being connected in series, alternate coils being wound respectively right and left handed, the sum of all their electromotive forces will be taken off at the collector rings by the brushes D D. As the bar e on the contact maker is fixed with regard to the armature, it will pass under the brushes C C once in every revolution, at the same position for the coil a, so long as the brushes C C are kept stationary. The voltmeter being in circuit only during the time in which the bar e is passing under the brushes C C, its reading will be continuous, and will indicate the voltage in the circuit corresponding to the angular position of the armature as shown by the pointer on the arm B. If we lay off on a straight line any distance, and let it correspond to 360 electrical degrees, or the angular distance through which the armature passes in completing a cycle, as shown in fig. 2, letting distances on the line correspond to different positions of the armature as indicated by the pointer on the arm B, and lay off above or below the line perpendicular distances which correspond to the voltmeter readings for each particular position, we can trace the curve showing the variation in the voltage through the cycle. The upper curve on fig. 3 was found in this way: b, c and d are the voltmeter readings taken for the position of the coil a, 45, 90 and 130 electrical degrees respectively from the position shown in fig. 2. At 360 electrical degrees the cycle will be completed, and, if the curve should be continued, it would repeat itself. This curve gives a graphic representation of the rise and fall of the electromotive force in the circuit, which is repeated every time the armature passes through 360 electrical degrees, being six times in each revolution for a 12-pole alternator; and if the machine is running 600 revolutions per minute, there would be a frequency of 60 cycles per second. In plotting the curve of amperes the instruments should be connected as shown in fig. 5, in which R is a resistance without self induction, across which the voltmeter circuit should be shunted. The readings on the voltmeter will be the voltage at the terminals of this resistance, which will be proportioned to the amount of current flowing; and if the resistance is without inductance, the phase will be the same as that of the current. 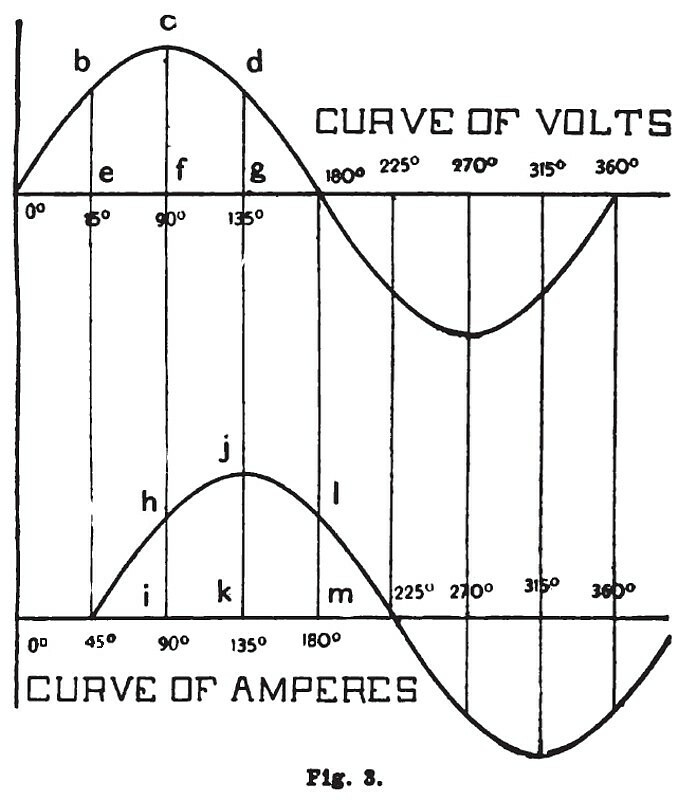 If desired, the voltmeter can be calibrated to read directly in amperes flowing through resistance R.
If there is no self induction or capacity in the main circuit, the curve of amperes which can be obtained will be in phase with the curve of volts. Zero amperes will then be found, as was zero volts, when coil a is midway between the poles, and self induction in the main circuit the phase of the current will lag behind that of the volts, zero current will not occur until after the voltage curve has passed through zero, and maximum current will lag behind maximum volts by the same amount. The lower curve in fig. 3 is for a current lagging behind the electromotive force 45 degrees. A comparison of the current curve and voltage curve furnishes a means for finding the power factor. If we multiply the voltage at any instant by the number of amperes flowing, we will obtain an expression in watts for the true power at that instant If, for instance, we take the position of coil a when it is directly under the pole-piece N, the voltage is shown in the curve of volts by the distance c f, and the number of amperes flowing is shown in the curve of amperes by the distance h i; then, by multiplying c f by h i we get the true power which is being transmitted at that instant. The maximum current is ; k, but by the time the maximum current begins to flow, the voltage has fallen to the value shown by d g.
If we divide h i by c f or j k by d g, we find the value of the power factor by which we multiply the apparent power to find the true power. It can be seen from these curves that the power factor varies with the angle of lag. As a matter of fact it is identical with the cosine of the "angle of lag"; so that if the "angle of lag" is known, the power factor can be obtained by looking up in trigonometric tables the cosine for that angle; and vice versa, if the power factor is known, a table of cosines will give the "angle of lag." The power factor for the curves shown in fig. 3 is then the cosine of 45 degrees, which is .70711. Besides affecting the output of a generator, a low power factor interferes seriously with the regulation. As long as the current is in phase with the voltage in an alternator, the effect of armature reaction is only a tendency to shift the field strength of the pole-pieces around the armature, and unless the pole-pieces becomes saturated, there is very little evidence of its effect in the outside circuit, except that it distorts the shape of the voltage curve to some extent; but if there is self induction in the circuit, and the current lags behind the electromotive force, the magnetic poles set up by the current in the armature are rotated back around the armature, coming into the proper position to oppose the strength of the field magnets, and the more the current lags the more nearly does the armature magnetism come into opposition with the pole-pieces. If the current lags behind the voltage 90 degrees, the magnetic flux surrounding the coils on the armature is at a maximum when the coils are midway between the poles, and is directly opposed to the magnetic flux due to the field coils. The field strength is then weakened by an amount equal to the maximum magnetic strength of the armature current. This of course pulls down the voltage of the machine. An alternator, which has been carrying a non-inductive load of lamps, will require a greater field excitation to keep up its normal voltage should the load be changed to one of motors. A generator of good design, carrying a normal load with power factor of .95, would probably have a drop in voltage of from 25 per cent to 30 per cent should the power factor be lowered to .85. It is a well known fact, and is easily seen from the curves in fig. 3, that the power factor remains near to unity throughout a considerable variation in the "angle of lag," and begins to fall away rapidly only after the angle becomes very large. Therefore, as far as the efficiency of an alternating system of distribution is concerned, inaccuracies in a power factor indicator when the "angle of lag" is small and the power factor almost unity would be unimportant. But armature reaction is proportional to the "angle of lag," and variations affect the regulation as much when the angle is small as when it is large; so that for the sake of regulation it is highly essential that a power factor indicator should give accurate readings when the "angle of lag" is small.